iZotope's Iris 2 is our sonic weapon of choice. Traditional synthesis methods are still as relevant today as they've ever been, but the creative possibilities are infinitely multiplied when regular waveforms are replaced or combined with sampled timbres. Ambience, recorded instruments, vocals, animal noises, soundscapes and everyday sounds can all be used as waveforms within any sample-capable synth, blended together with more consistent oscillator-generated tones to form a unique musical element. Here we've merged a triangle wave, a choir sample and two types of noise in iZotope's Iris 2 (although any sampler could achieve a similar result). Each 'oscillator' is a single piece of the four-part puzzle, creating a cinematic chordal soundscape. Note how the final stage of overall processing transforms the sound into a cavernous bed of noise - we've used a lot of reverb to accentuate the unsettling vibe we're seeking. 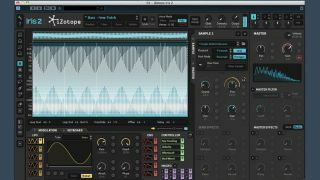 Step 1: We've loaded up an instance of iZotope's Iris 2 and programmed a basic MIDI chord sequence spanning several octaves. A raw triangle waveform, tuned down by two octaves, forms the clean basis for the patch. A 3Hz LFO modulates the wave's fine tune parameter, adding vibrato. Step 2: In Iris 2's second sample slot we load a vocoded choir sample, this time transposed down by one octave. A second LFO, this time set to 50Hz, adds a subtle buzzing effect to the vocal by modulating its pitch in the audible frequency range. Step 3: Over in the third sample slot, a field recording of street noise is blended in. This mixes in a dark layer of grit behind our other sounds, gluing the first two, cleaner layers together and adding subtle texture. Step 4: In the fourth and final sample slot, we've loaded a recording of seaside ambience. Once pitched up by three octaves, this quiet layer adds treble dirt to the soundscape. A touch of Iris 2's aliasing distortion gives even more high frequency interest. Step 5: Over in the amplitude envelope section, we set up a slow Attack, maximum Decay/Sustain, and long Release, turning the tone into a gentle, drifting pad sound. A bit of EQ on the channel's output removes honking mid frequencies and unwanted bass rumble. Step 6: To finish, we drench the soundscape with Iris 2's onboard spatial effects. A touch of chorus adds movement, then a huge dose of long reverb transforms the tone into a ghostly bed of sound - we set the amount to 100% wet for a truly eerie effect.